Turn the stop lamp switch and brake pedal position switch (if equipped) 45В° counterclockwise. Loosen the input rod lock nut (1). Adjust the brake pedal height to the specification. Check the height with the floor trim removed. The threaded end of the input rod (2) must project to the inner side (L) of the clevis (3). 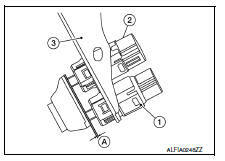 Brake pedal height (H1) : Refer to BR-54, "Brake Pedal". Tighten the input rod lock nut to specification. Refer to BR-34, "Exploded View". Check the brake pedal for smooth operation. The stop lamp must turn off when the brake pedal is released. With the threaded ends of the stop lamp switch (2) and brake pedal position switch (if equipped) (1) contacting the pedal bracket (3), turn the switches 45В° clockwise to lock in place. Check that both the stop lamp switch (2) and brake pedal position switch (if equipped) (1) contact ends to brake pedal bracket (3) clearance (A) are within specification. Make sure that the clearance (A) between the brake pedal bracket (3), stop lamp switch (2) and the brake pedal position switch (1) contact ends are within specification. Clearance (A) : Refer to BR-54, "Brake Pedal".